Time does seem like a Circus lately....Here's the card I created for CPS Sketch 103. As you can see I rotated the sketch and used an oval instead of the circle. 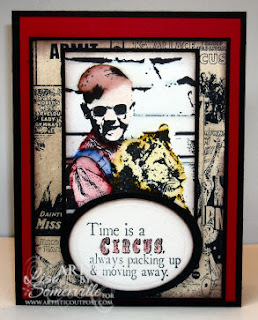 The images are all from the Artistic Outpost Vintage Circus plate. The main image is stamped in Black Archival, then colored using the Marker Water Coloring Technique. 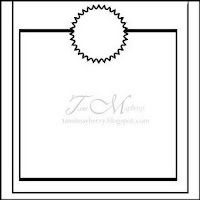 The Background panel is stamped in Black Archival, with Distress Inks applied over the panel to add some aging. 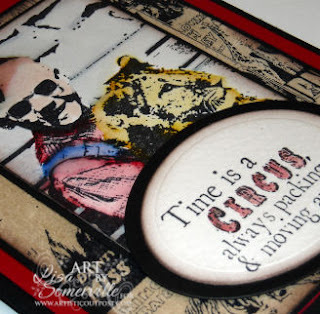 The sentiment was stamped in Black on watercolor paper then cut using Oval Nestabilities, and aged with Distress Inks, coloring the word Circus with red ink and an Aquapainter. Amazing what you can do with those markers and layouts! You go GF! I like what you did with the layout much better then what they posted---your card is GREAT! heeheehee! this is fantabulous! makes me *S*M*I*L*E*! Lisa - this is wonderful! I just love that adorable image and the way you colored it - Great use of that CPS sketch. What a cool card!! Love the stamping you did! Great job with sketch 103...thanks for playing at CPS this week!